The Recirculating Polygeyser Wastewater Filter uses the same proven filtration technology as our traditional PolyGeyser but has been optimized for biofiltration. 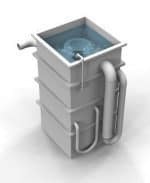 The unit is designed with a built-in recirculation basin for improved treatment of domestic, industrial, and agricultural wastewaters for TSS, BOD and ammonia removal. Discharging water only when new wastewater is added to the internal recirculation basin, flow can be adjusted to meet virtually any discharge expectation. The backwash frequency of the filter can be adjusted to optimally manage biofilms to avoid biofouling. An optimally tuned pneumatic backwashing combined with EN media encourages the development of slow-growing bacteria for the treatment of refractory organics associated with BTEX and MBTE typically found in groundwater contamination. This unit is an excellent choice for treating poorly defined industrial wastes as it can attack both particulates and dissolved contaminants without much concern about oxygen or biofouling. Recirculating PolyGeysers are tall filters (up to 10 feet) with high bead bed capabilities ranging currently from 10 to 250 cubic foot with internal recirculation flows ranging from 100 to 2,500 gpm. Normally equipped with auto-pneumatic sludge discharge, these units are intended to operate for months with periodic pass-bye inspection to assure that the air blower and input pumps are operating. The air blowers drive the recirculation loops and only the beads, water, and air move within the unit – there is nothing to break, not even a check valve. These filters can even be buried, as all vital components can be reached from the top. Designed for heavy loads associated with full scale commercial treatment.